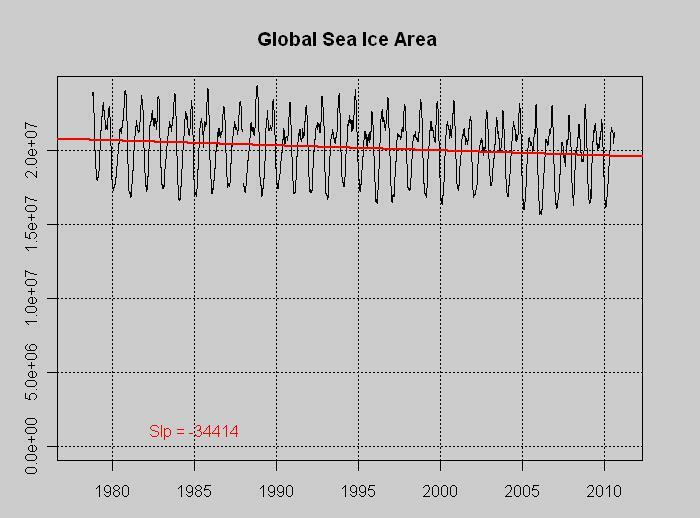 When I read about sea ice two years ago, it was alarming. 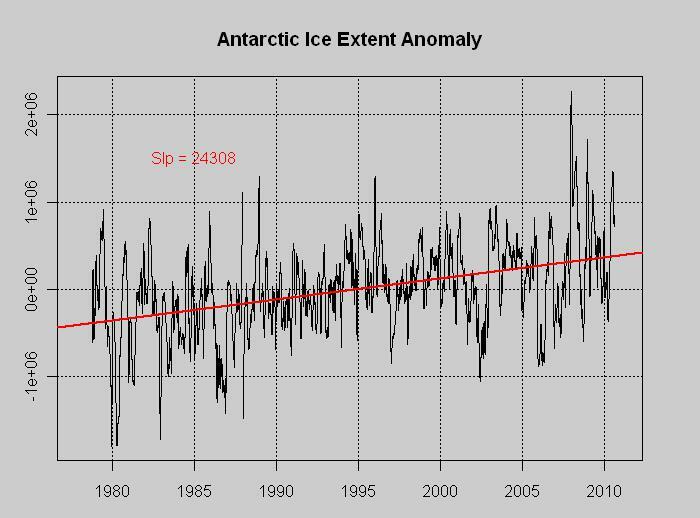 I mean, I’m enough of a realist to know that data is data and nobody would write that the polar ice was melting unless they was a serious problem. The sea-ice was in as much trouble as a semi-crystalline block of H2O can be. What would it be to be young and happy like that again…? These next two plots are Air Vent exclusives. 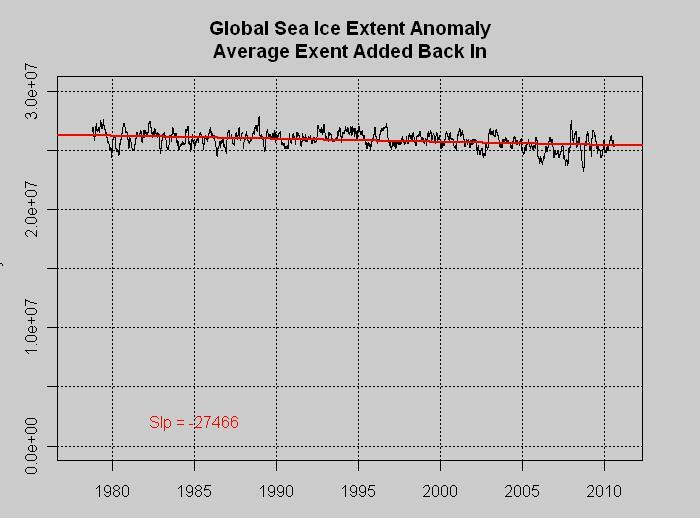 I add back in the average global ice area so you can grasp the true magnitude of the decline. I doubt that these have ever been presented without one Sod to blast them for dishonesty, however I do believe they are good depictions of the magnitude of the ‘problem’. This entry was posted on August 12, 2010 at 9:49 pm	and is filed under Uncategorized. You can follow any responses to this entry through the RSS 2.0 feed. You can leave a response, or trackback from your own site. All of this was created from gridded NSIDC data in R.
Also, for sea ice buffs, normally my ice area/extent is done with a 15% threshold, I changed it to 5% minimum for this post. Jeez, what’s everybody got against the NW Passage? Let it melt! Open ‘er up! All year ’round, not just the summer. The polar bears will do just fine. Probably better, like in past warmings. You are an eminently rational and reasonable gentleman. Sadly those are commodities that are valued about as much as coal tar in this era of pseudo-scientific alarmism. I once tried to point out the scale of the global average temperature increas over the last 130 as correlated to the diurnal variation of even tropical environments, let alone temperate ones. It made even less difference in the graph than your ice global sea ice graphs. It was essentially a tiny ripple on top of the daily sinusoidal rhythms. I was of course accused of “distorting” the scale of the axes to fit my “agenda”. Beauty! I liked that a lot! “You are an eminently rational and reasonable gentleman. ” — That’s a pretty serious accusation sir, you have any data to back it up? Brian, you got that right. Chicks dig guys with blogs. 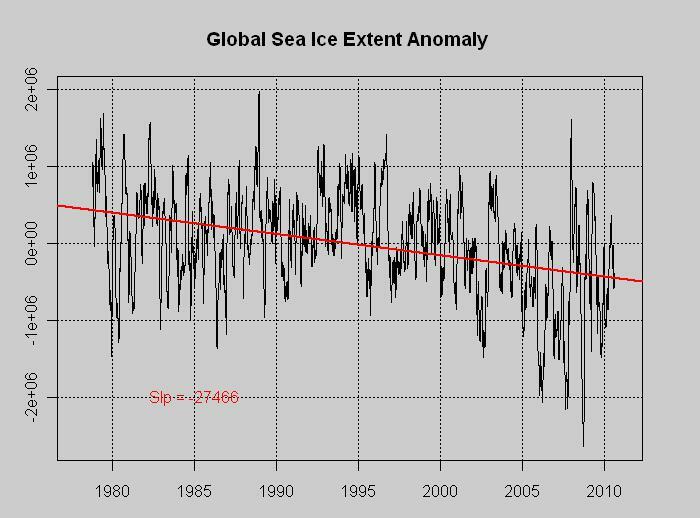 AGW alarmism, like any hysterical social movement, requires presenting data out of context to maximize the fear factor. Thank you for providing a context of rationality. Don’t tell your wife that! 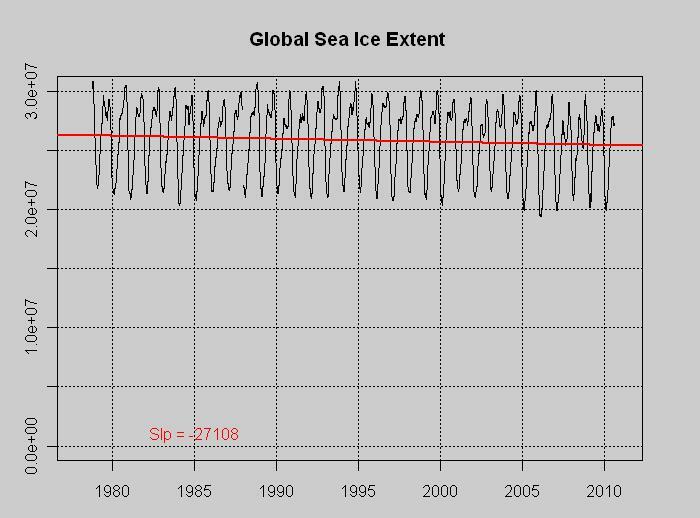 (1) ALL sea ice history begins in 1980 – before that there was no sea ice. 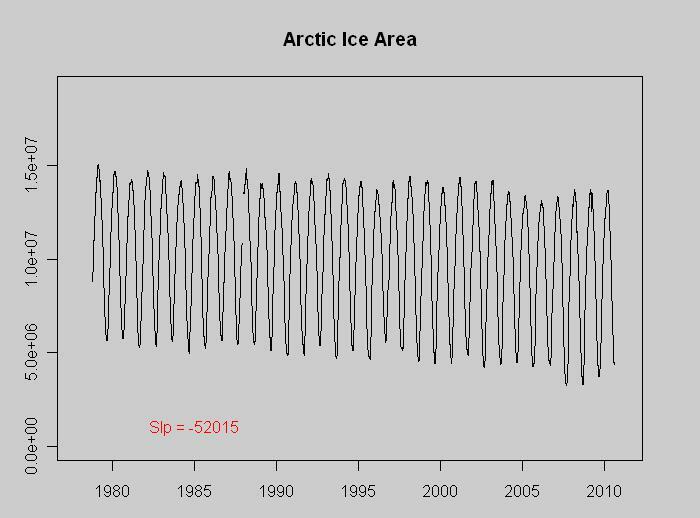 (2) All sea ice trends are linear, since weather, climate, and ice physics are all linear phenomena. In fact, I’m sure they can all be modelled using Laplace’s equation with constant coefficients. 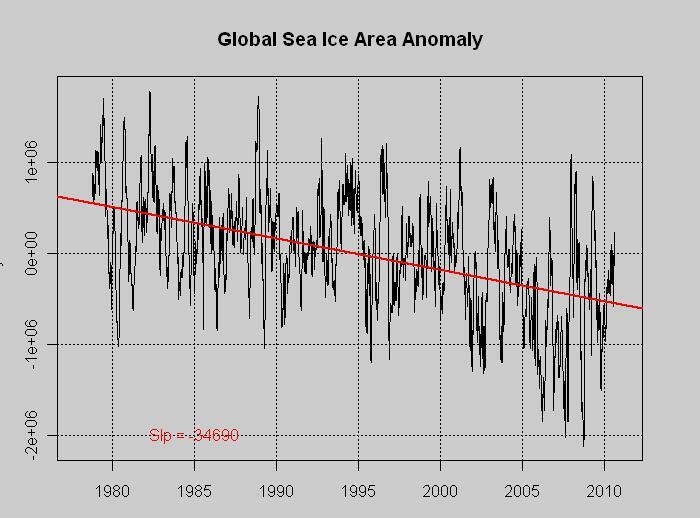 The real question is whether the trend in global sea ice is in the range of model predictions. Is the current trend actually related to increasing global average temperature or is it a fluctuation based on variation in ocean and air currents? The AMO index for July came in at 0.500. 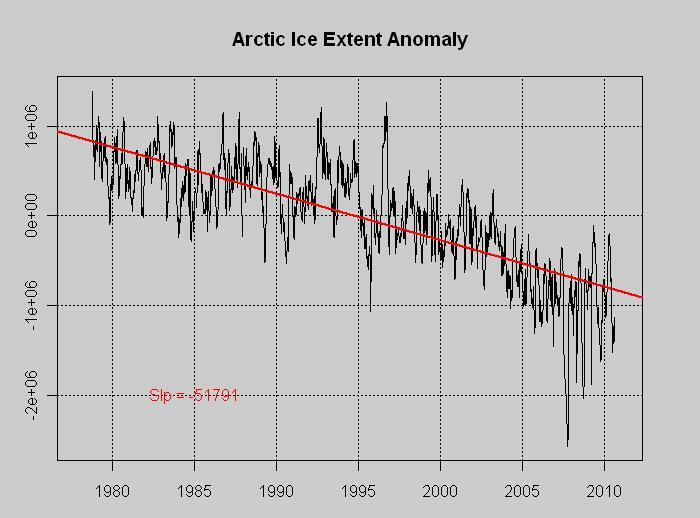 That’s still quite high even though the rate of loss in July in the Arctic slowed compared to June. Sure but the important question is if the size of the blog matters. I just love the little trend on top of that enormous extent! 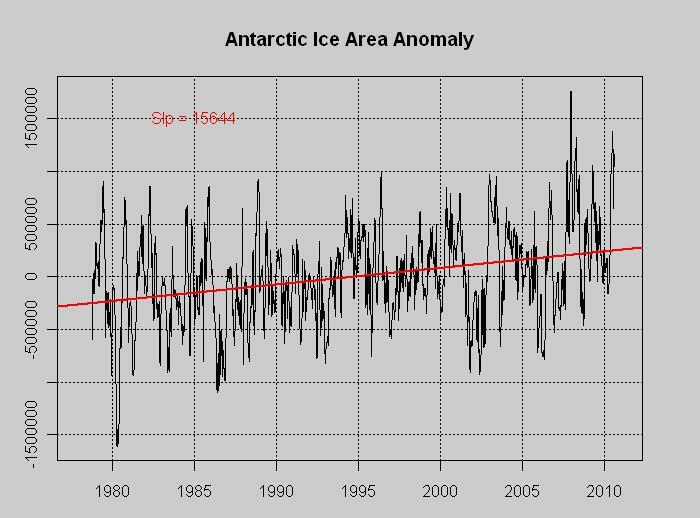 Which is why ice extent is presented as “anomalies” (in fact, most things in climate science are apparently “anomalous” since that’s the preferred method of presentation). Yes, absolutely every measurement of climate shows a cycle, is cyclic, behaves in cycles and yet the alarmists must use straight lines to scare the beegeebee’s out of the uninformed and uneducated. It’s a farce. And it’s hard to watch. Thanks for all the fine work here putting sea ice melt into perspective. 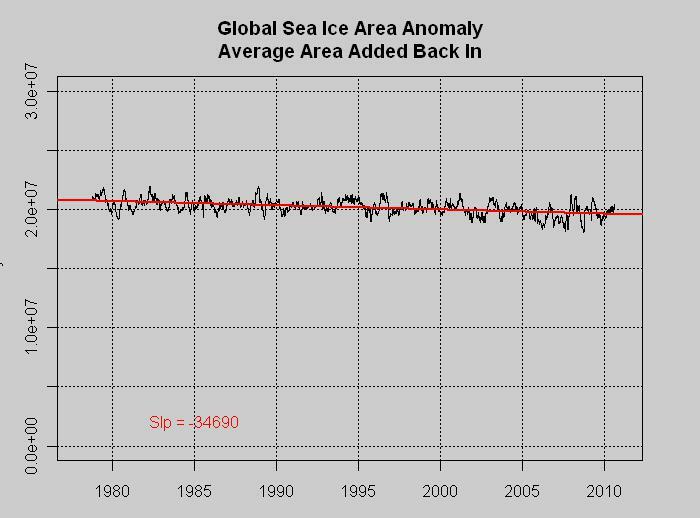 I utterly fail to see how recent sea-ice melt patterns provide confirmation of CAGW; yet every time a glacier calves a big berg MSM is all over it. An open NW passage has happened before – probably will happen again – so what? It’s rather simple (naturally). The poles vary fastest, so if we’re to have a Warming Catastrophe the poles will heat up first. I’m all for warming, and agriculture in Greenland, and the greening of the Sahara, and vineyards in Scotland and Sweden. Bring it on! Well, Brian, I live in South Carolina. I have enough warmth, thank you. 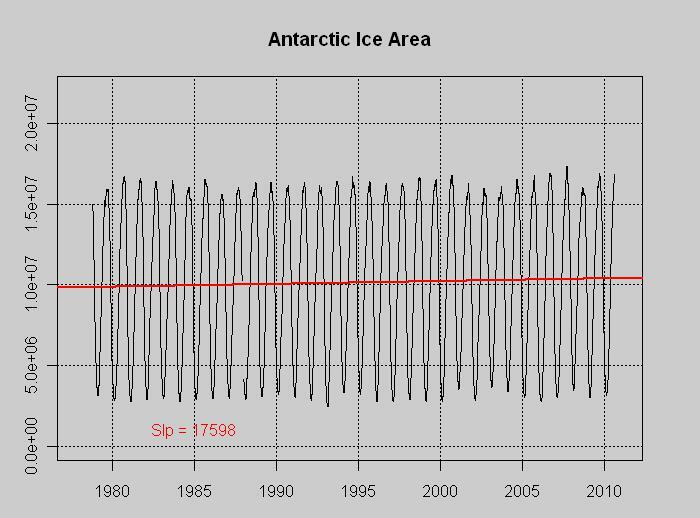 However, as noted, it is supposed to happen at the poles fastest. Of course, WUWT has a large number of places in the world that have the largest increase in the world, so it makes it hard to know what to think. And with MMH10, I think the claim of the models’ skill just got called into serious question. It’ll all be a bit more difficult to do in the future, using satelite data.. The NPOESS (National Polar-orbiting Operational Environmental Satellite)will not have any sensors that measure the sun’s energy output on the 2nd and 4th satellites. The GOES-R http://www.goes-r.gov/ (Geostationary Operational Environmental Satellite-R Series) has had 14 sensors cancelled. No data for cloud base height, ozone layer, ocean color, ocean turbidity and cloud imagery, snow cover, etc. Effectively neutered. Landsat 7 (currently in orbit) is broken leaving data gaps. Scientists do not get all the information they should. No sensor for movement of greenhouse gases and pollutants. No sensor to monitor temperature changes on Earth over time. But per the article NOAA and DOD failed to try to get the funding to keep the eliminated sensors. The sensor to measure how Earth’s temperature reacts to changes in Solar energy was cancelled by the Obama Administration at the end of June 2011. 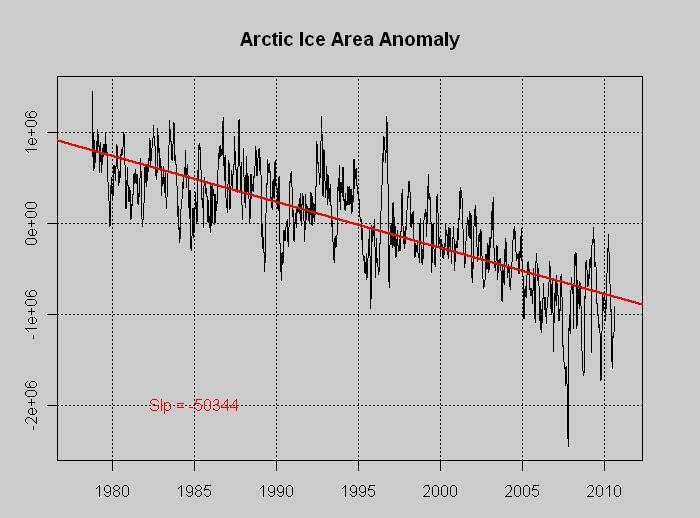 As for Arctic sea ice extent, this might help..
All of which is to say that accurate data is the enemy of the CAGW cult. and this is the difference betwen the work of real scientists, and the blog stuff done by Jeff and company. the first point to think about, is which data matters. and that is arctic summer extent/area. and summer, because that is, when sunshine will hit dark water, instead o white sea ice. adding useless data, to give the appearence that the trend is smaller, is exactly the type of data mismanagement, that people here constantly complain about. Nice bit of straw-clutching, sod. Any chance of a coherent reason why one pole “matters” and one doesn’t? “We know that the antarctic will act slower”doesn’t really cut it, when the antarctic ice trend is directly opposite to that in the arctic. 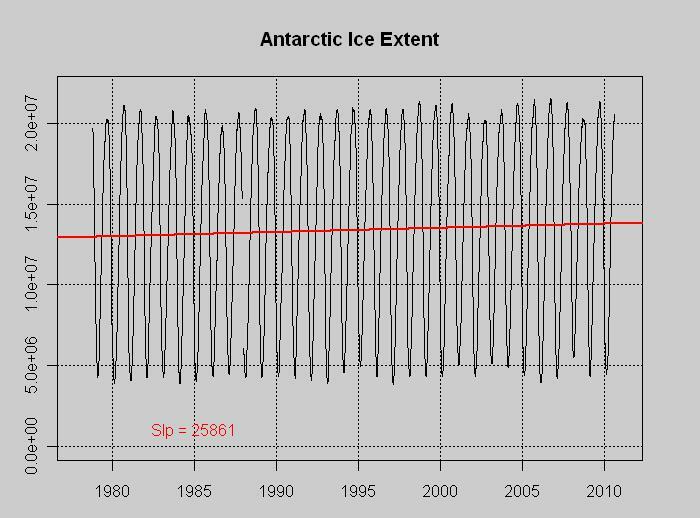 Using your reasoning, it wouldn’t be much of a stretch to extrapolate from the antarctic ice area and scare people with the thought that by 2030, sorry Pachauri typo, 2300, the whole world will have iced over. The Sod-den argument is even strawier than you point out. Who says warming is bad? AlGore? Bring on the Holocene Optimum! You’ll love it, I promise. 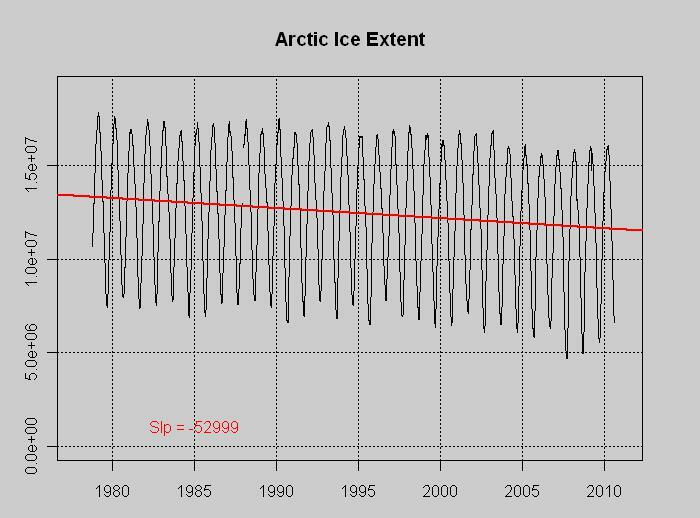 Act slower to melt is different from increase to offset the Arctic. The models are overstating the case. I think most of what Sod argues is the result of what someone on this blog id’d as “post-modern science”,whatever that is. Maybe its some fuzzy logic system that sez to one “just think about it-it must be CO2”. Alot of his type of argumentation probably comes from US colleges where the science requirements is met with “earth science” type classes. The title of the last graph has a typo. Average Exent Added Back In” Change “Exent” to “Extent” please.